I have throughout the last year on several occasions, made mention of our historical time-line “soon to feature on masterbuilders.co.za”. When we began the exercise, I had no idea it would take as long as it did and admittedly, had moments when I considered scrapping it. The process required a fair amount of research, lots of scanning from old publications, and because of its time consuming nature, we took the decision not to prioritize it. 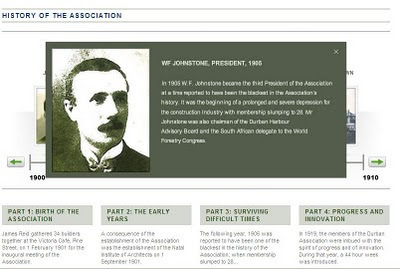 It encompasses eleven decades of Association history, featuring 5 images per segment with a short commentary on each, which makes an appearance when clicked upon. This particular project did become a labor of love, and I thank Pieter Rautenbach, a font of information, who gave freely of his time. Motor Industry vs Bill Gates.